Always bring joy to your people with the Honda new Odyssey. With 5-Year unlimited KM warranty, room for 7 or 8 seater, advanced connectivity and 5-star safety. 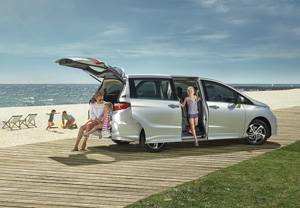 From bundles of joy to beloved grandparents, the Honda Odyssey ensures enjoyment for all. Because the family that rides together, makes memories together. The Honda Odyssey not only has the space for growing families, but the features to keep everyone happy while you roll down the road. Can't wait to experience the joyful moment? Book a test drive and enquire now with Griffith Honda in Griffith through our Service department online.